APS generates statistical reports on issues in undergraduate physics. These reports are freely available for your use. You may use our graphs in reports and presentations. Credit APS and the source as shown on each graph. 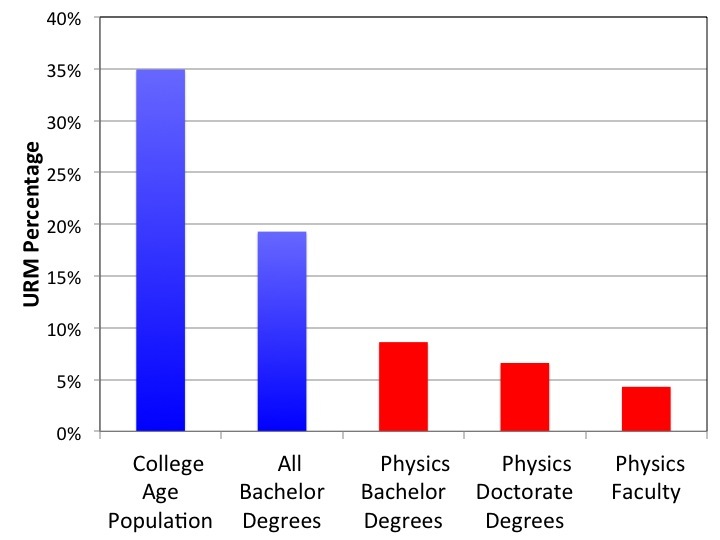 Physics Degrees Awarded to Underrepresented Minorities in the U.S. 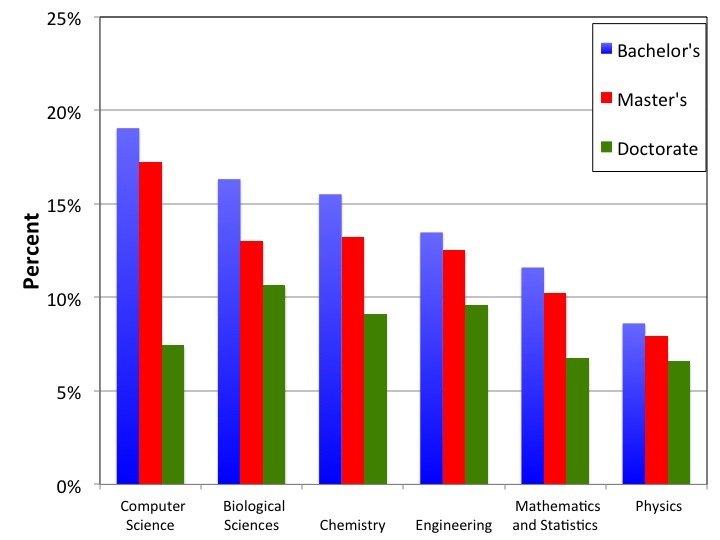 This graph shows the percentage of underrepresented minorities (URMs) in physics compared to the percentage of URMs in the U.S. college age population and among all bachelor degrees awarded. Data for the bachelor degrees estimation is an average of 2002, 2003, and 2004. Data for the doctoral degrees estimation is an average of 2008, 2009, and 2010. All degree data is collected from the IPEDS Completion Survey by Race. This graph shows the percentage of degrees in various fields earned by underrepresented minorities (URMs) at US institutions. In this case, URMs include African Americans, Hispanics and Native Americans. Degrees awarded to temporary residents are not included in the calculation. Data is collected from the IPEDS Completion Survey by Race. The IPEDS data represent a 3-year average for the bachelor, master and doctoral degrees for the three most recent years data is available. Percentage of doctoral students completing PhDs in Math/Physical Sciences for Asian American, White, African American, and Hispanic American students. Promote and disseminate successful program components to the physics community.